The SmartLiveCasino website has more than 250 different games including Slots and 3D slots, Live BlackJack, Live Baccarat and Live Roulette. They also offer three interesting sign up bonuses. The current welcome package can reach €/$/£1,000 in total plus up to 70 free spins on Guns N’Roses. In order to get the full package, new customers need to comply with the terms and condition which are as follow. Important : Smart Live Casino is temporarily closed while his Smart TV Broadcasting Ltd operating licenses are pending a review by The UK Gambling Commission. Please, try one of the casinos listed here instead: online casinos. First deposit bonus: make a first deposit of €/$/£20 minimum to get a 100% welcome bonus up to €/$/£200. For instance, for a €/$/£100 deposit, they get a €/$/£100 bonus. The same way, if they deposit €/$/£200 or more, they get a €/$/£200 bonus. To claim this 100% bonus, players will need to enter code BONUS1. During this first step, new customers will also get 10 free spins on Guns N’ Roses (even if they don’t make a 1st deposit) plus 20 additional free spins if they do. Second deposit bonus: 50% up to €/$/£300 on the 2nd deposit (min €/$/£20) + 20 free spins. To claim this bonus just enter code BONUS2 in the bonuses section. Third deposit bonus: 50% up to €/$/£500 on the 3rd deposit (min €/$/£20) + 20 free spins. To claim this bonus just enter code BONUS3 in the bonuses section. Gamblers who love to play Roulette will find friendly and professional live croupiers and live action, broadcast directly from the SmartLive TV studios in the UK. There are two ways of gambling. Those who want to improve their skills and play without money can “Play for Fun”. On the other hand, those willing to play for real cash will use the “Play for Real” feature. Live casino presenters are mainly female, but there is also one male dealer: Ayla, Bronia, Cat, Christina, Elspeth, Kirsty and Martin. Smart TV Broadcasting Ltd. is a company established in England and in Wales which has its headquarters in London. Smart Live Gaming is authorized and regulated by the UK Gambling Commission. 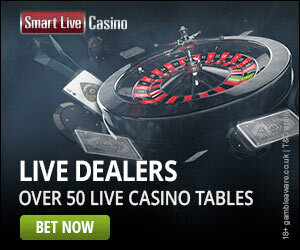 Smart Live Casino is registered in Malta (Europe). It is reminded that gambling is forbidden to people under 18 years old.